Full disclaimer. I love inspirational teacher quotes. I love posting them on the Wife Teacher Mommy Facebook page, Instagram, and Pinterest to inspire teachers. I truly believe surrounding ourselves with positive thinking and inspiration is a good thing- something we should all be doing, in fact. And I think all inspirational quotes have good intentions behind them. But this one just BUGS me. So I decided to write this blog post about it. Like any analogy, this quote seems to inspire. A teacher, lighting the way is an image we can all aspire to be, right? Of course, we love our students and being a light in their lives. However, if you read between the lines, this quote is damaging. Read it again. What is it really telling us? A teacher consumes or uses up itself. A body consumes food. A consumer is one who buys goods or services. An educator should not consume oneself for the sake of others. Note: This post contains affiliate links. See disclosure. 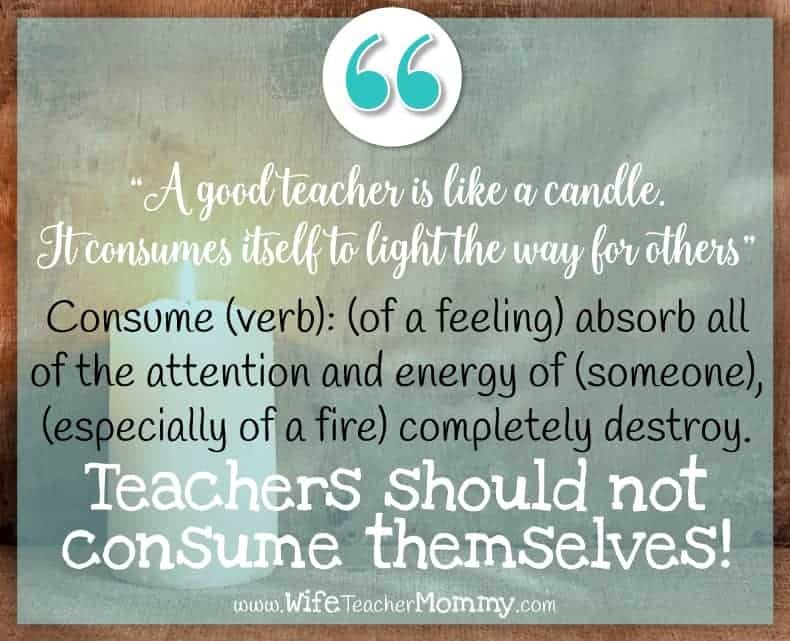 Teachers are not like candles to be consumed. When a candle is consumed, it is burned out. There is nothing left. Like the illuminated flame, as educators trying to be everything for everyone, we too can suffer from teacher burnout. It’s not just for first or second year teachers. In fact, veteran educators are also susceptible to the consequences of putting so much of themselves into their job that they become consumed by it. The candle quote above is just one of many examples of supposedly “inspirational” teacher quotes. Take this classic as an example. “Teachers are not in it for the income, but the outcome.” Yes, teachers care about their students and the outcome we make in our job is invaluable. And we didn’t go into this career to make a ton of money, that’s for sure. We don’t need a lavish lifestyle. But, again, we need to care for ourselves. Don’t teachers deserve an income that allows them to do just that? These two quotes are an example of much of society’s view on teachers…. a “good” teacher is the one who gives up absolutely everything they have to give, at their own expense. And believe it or not… it begins to shape our OWN mindset and priorities. When we ourselves believe that we need to continue to give and give from an empty cup, that is the recipe for teacher burnout. Today, I am here to dispel the myths behind these quotes and share my tips for teacher self care. 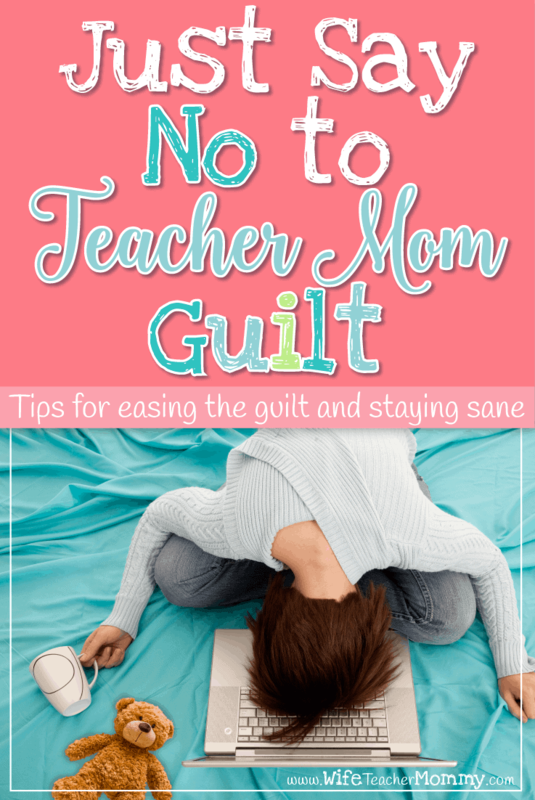 Avoiding teacher burnout can be difficult, but there are things you can do to help yourself be the best teacher you can be without sacrificing yourself as a wife, mother, and individual. It’s easier said than done, but remember your why. If you’re not working in a building or a district that supports your family as your number one priority, consider other options. This doesn’t mean to quit your job without looking back, but seek out places that will embrace your family and purpose. Incorporate your family into your teaching life. Share pictures of your kids with your students. Talk about your vacations, children’s successes, and celebrations. Building relationships by communicating your own familial story will help you keep yourself as an individual and a mom while you’re teaching. Leave work at school, especially on the weekend. This may be one of the hardest things to do, particularly in your early years of teaching, when you’re adopting new curriculum, or you have a new grade level or content area you’re teaching. 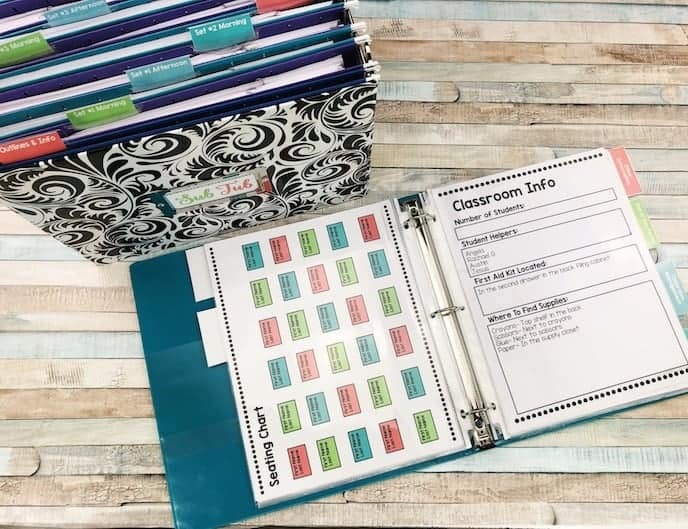 Do your best to optimize your plan and before and after school time at school, and leave that teacher bag there at the end of the day as much as possible. If you must take work home, designate one night a week as “work night”, and let the rest wait. Remember, your students have lives outside of school too. Don’t assign homework every night. The bonus is that you won’t have work to grade every night, and their families will be thankful for the quality time they’ll have together as well. Take a day off when you need it. 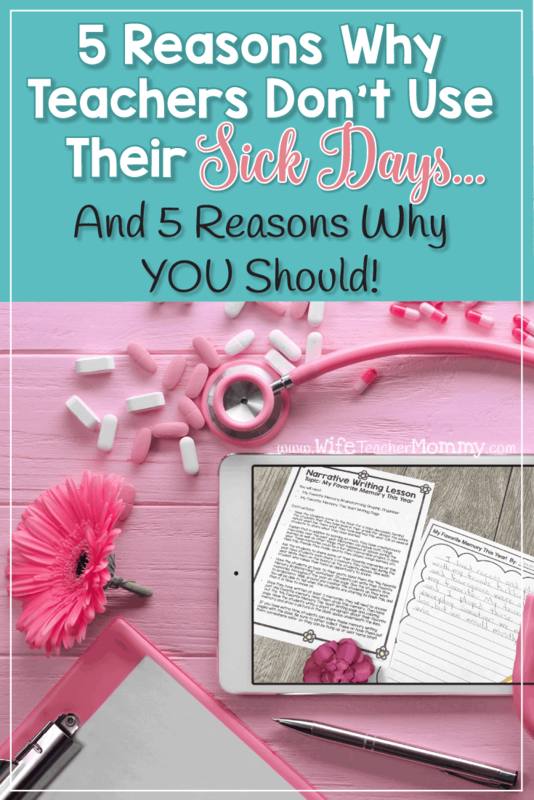 Many teachers feel guilty using their sick days. Don’t! These days are there for you- whether you are sick or just need a mental health day. 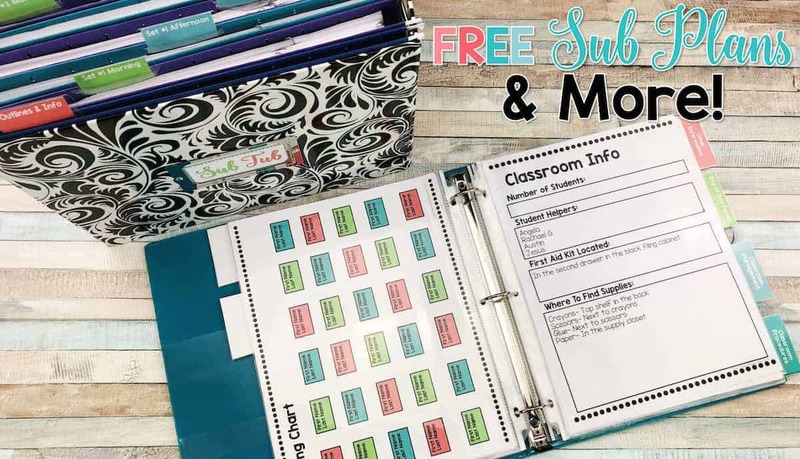 Sub plans can make taking a day off a pain, so be sure to check out my free sub plans & more in my free resource library to make this easier for you! 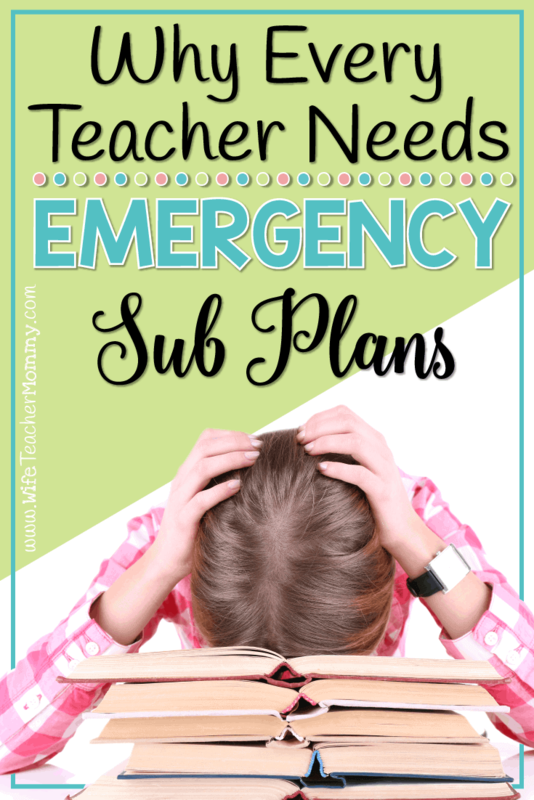 You’ll get access to several sub plan lessons, editable substitute info forms, thank you cards, and more to make the process of taking your time off a lot easier. 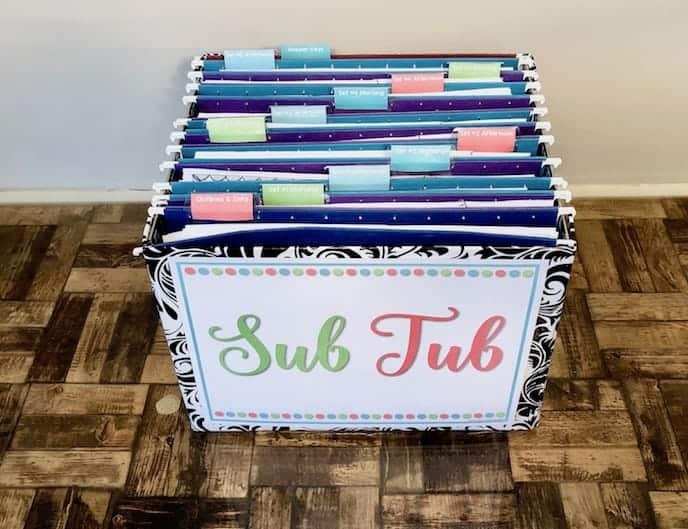 For even more extensive resources, you can also check out full sets of Ready To Go Sub Plans and substitute binders in the Wife Teacher Mommy shop. They are also available in my Teachers pay Teachers store. Take time for just you. Wife and mom are important titles, but you are an individual that also needs “me” time. Take a moment before work and family responsibilities consume you and celebrate yourself. It doesn’t need to be anything outlandish. Take a hot bubble bath. Get a pedicure. Read a book. Go for a walk. Hit the gym. Have dinner and drinks with a friend. Watch a movie, or binge watch a Netflix series. Do something you want to do without guilt. This is something I have recently started that has made a HUGE difference in my life. I have a short (repeat, short) list of things I strive to do EVERY morning and EVERY night that are to take care of myself. I wake up and do the AM routine before my kids wake up and before I start working. (For me, this list includes prayer, scriptures, exercise, and positive declarations). I do the PM routine right before I go to bed (for me- this includes my meditation app, finishing my food diary in My Fitness Pal, writing something in the “gratitude” section of my planner, and writing my top 3 for the next day). What you put on these lists is up to you. But this is a great way I’ve found to take care of yourself every day. One of my current favorite things to unwind is listening to an audiobook- especially audiobooks about self care and self improvement. If you’re looking for a good title, I’m currently listening to Girl, Wash Your Face by Rachel Hollis and it is amazing. I am a work-a-holic, wife, and mother and I relate to her so much. Brene Brown is another amazing author of many audiobooks about self care. You can find all of these books on Audible and get your first two books FREE using my special link here. Listening to these books has made a huge difference in my life- even though I only get a chance to listen for short periods of time of day. I listen in my car, while I’m doing dishes, or in bed before I fall asleep. However, even surrounding myself with reminders on how to take care of myself and become better person helps me take some time to focus on ME. Not my students, or my spouse, or my kids. This one depends on your personal beliefs and spirituality. I personally believe that meditation is for everyone. Every night, I use the app Headspace as part of my PM routine (mentioned above). It is a great way to forget about all of the troubles from your day and take a moment to let it all go. It has helped me gain much needed perspective during stressful times. And if you’re spiritual, prayer can also be a great way to connect with your higher power to achieve this goal as well. I personally use both. Why is this one word so hard to say? As women, we tend to say yes to everything. And often, that is because we want to do everything. But the reality is, we can’t. At least, we can’t do it all well, and we can’t do it all while taking care of ourselves. Learning to say “no” is a very important skill. Asked to join yet another committee at school? Or take on more responsibilities? Or coach another team? You may need to say no. This isn’t only at work. You may need to say no in your personal life to make room for self- care as well. This includes extra responsibilities in your community or church, helping neighbors and friends. These are all good things, but there is such thing as too much of a good thing. Setting boundaries is okay. 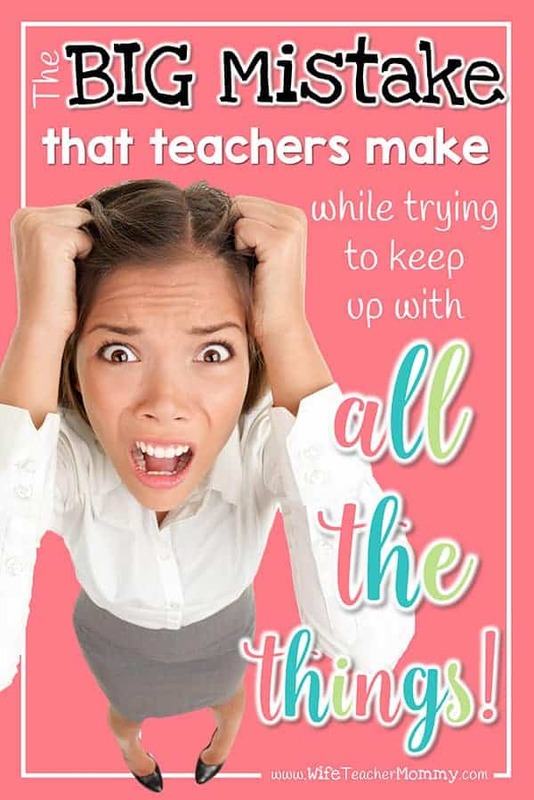 Don’t allow teacher burnout into your life! 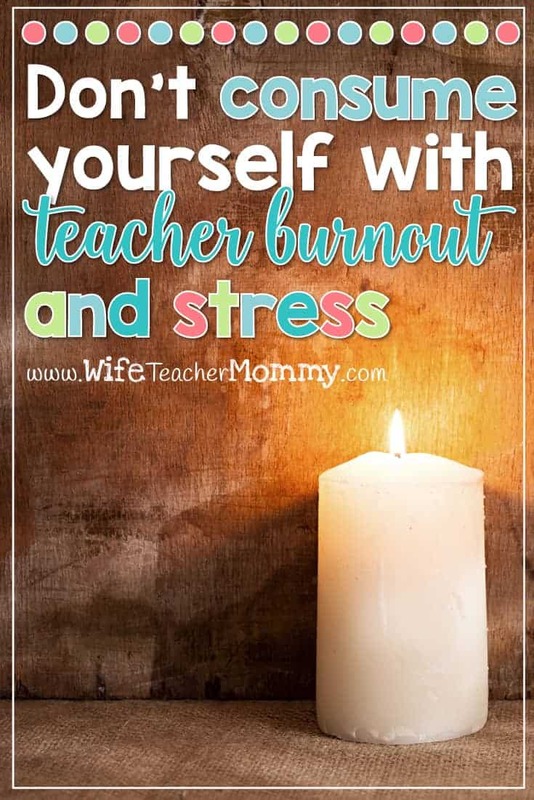 Teacher burnout like a candle being consumed by a burning flame is real. We absolutely can’t be everything to everyone at a single moment in time. What you can do is be the best teacher you can be by utilizing your colleagues, resources, and your own expertise. You can take some time away from your classroom to focus on yourself and your family. You are an amazing teacher, but you are also so much more. Remember… you do NOT want to consume yourself with teacher burnout and stress. While it may feel like you are expected to do it all, you shouldn’t. You can say no. You can take the time for yourself that you need, so you have the ability to serve your students and your family. I am pleading with you to give yourself permission for self care, in whatever way works for you. Don’t wait until the perfect time. It will never come. There is always something left to do. Start now. And by that… I mean start TODAY. Do not put it off until tomorrow… because you can always put it off until tomorrow. Make your list for an AM/PM routine. 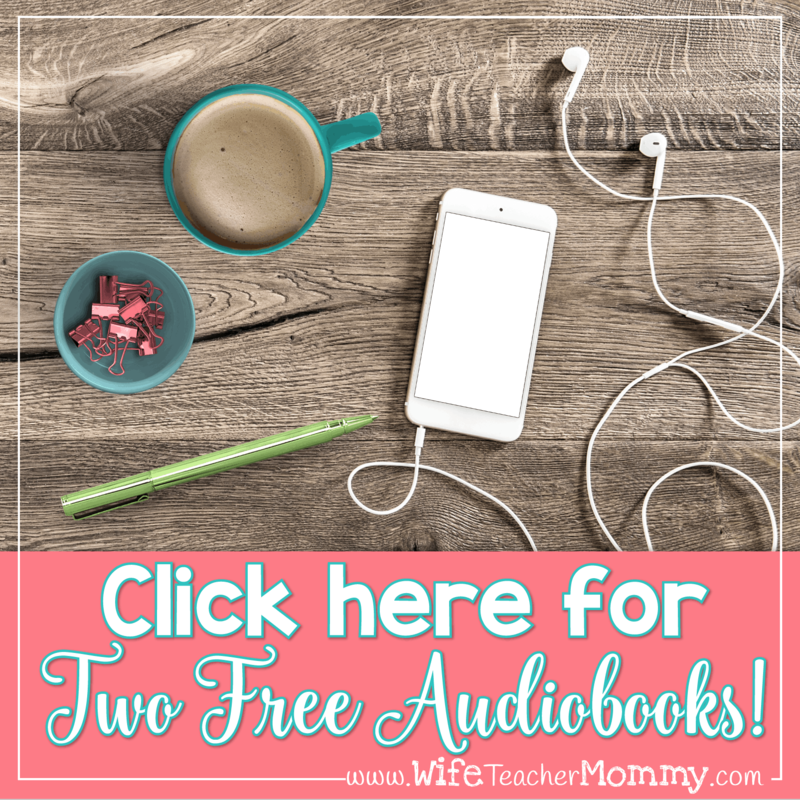 Download an audiobook. Put your work away for the day, and spend some time with your family. Heck, do all of it! And I promise you, when you do this, your light will shine brighter and you WILL light the way for others. Just don’t consume yourself in the process. What are you going to do to take care of yourself and avoid teacher burnout? I’d love to hear in the comments. 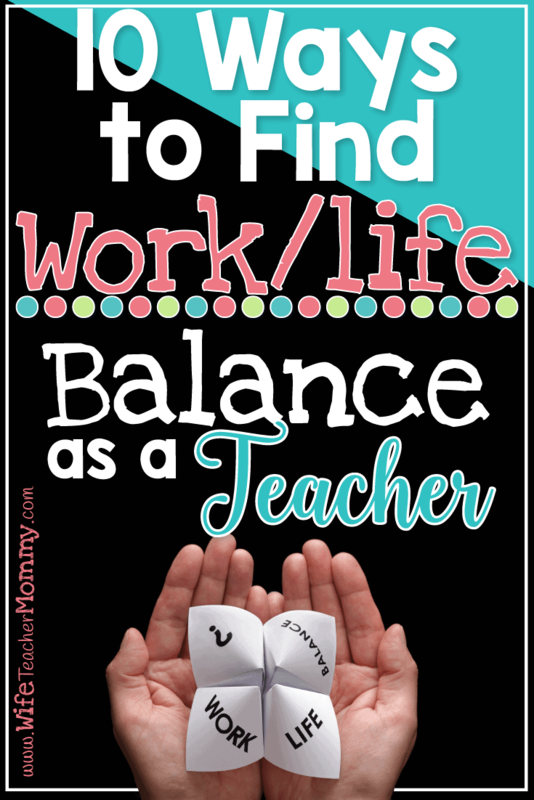 Looking for more posts to help you ease your teacher burnout? You may enjoy these posts below! 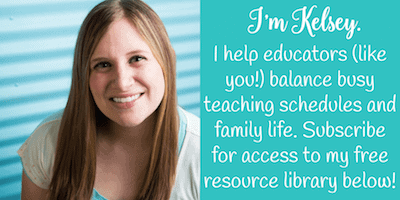 Be sure to also sign up for the free resource library for 24 freebies at the time of writing (and counting) to help make your teaching life easier! You’ll also want to follow the Wife Teacher Mommy Facebook page, Instagram, and Pinterest. Thank you for sharing your thoughts. It is easy to feel that we, as teachers, have to do it all. And the “all” often leaves us neglecting our families, freetime, and ourselves. The pressure to perform as well as other colleagues is always there as well, making us feel guilty if we don’t put forth as much effort and results. As I have reached two decades of teaching, experienced the death of a parent and the decline in health of the other as well as supporting my husband through a major illness, I have learned to put things in perspective and family and personal time has taken on a more important role than before. I still struggle with those feelings of guilt and being inept, so I truly appreciate a reminder that it’s okay to take time for myself. Again, thank you , thank you, thank you! Getting up at 5 am and running with the dog is what I started this school year. It wakes me up and help me get my “head on straight”. Also, while I’m eating breakfast I read devotionals on from my You Version Bible app. After 24 years of teaching I have finally learned to take care of me first. Leave the grading at home and spend time with God and family. Thanks for the reminder that this is ok.